On Friday Year 6 launched our new I Value this term, Imaginative, with a very enjoyable and interesting assembly. Year 6 clearly communicated how important our imagination is and that no one can ever take it away. Thank you Year 6 and to all the parents who attended and showed their support. Year 1 and 2 thoroughly enjoyed themselves visiting the ‘For Arts Sake’ 3D museum. They loved acting in a range of very clever 3D paintings and all had a good giggle looking back through their photos. Some great inspiration for their ‘All About Art’ topic this term. Well done KS1. 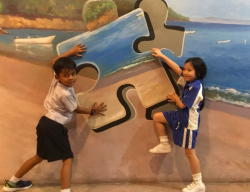 As part of their topic ‘Hua Hin as a holiday destination’ Year 3 and 5 visited Hin Lek Fai. They studied the human and physical features of the this wonderful city and Year 3 were particularly fascinated by the Cactus plant and the spectacular views!. Year 8 have started learning about ‘globalisation’ through the exploration of integrated cultures in English. In support of their learning, they visited a local mosque to develop their understanding of Muslim culture. On Saturday, Year 10 Global Perspectives students travelled with the Jungle Aid Foundation to the Karen refugee community at Pala-U Noi. The students helped provide medical support for the villagers, organized recreational activities for the children and assisted with village management discussions. In addition, they conducted preliminary research for their ongoing Global Social Leaders project. Year 10 were able to make links with local teenagers and gather opinion about developing a waste disposal system for the community. We will be returning to Pala-U Noi in the coming months to implement their ideas. We have had 2 confirmed cases of Flu type A in our EY2 class. As a precautionary measure, we have closed both EY1 and EY2 classes for two days so that we can undertake some deep cleaning and fumigation. We plan to open these classes again on Thursday January 24th. • Fever or feeling feverish/chills. • Young children can have vomiting or diarrhea. If your child has any of the above symptoms please keep them at home. If your child has a confirmed case of Flu type A please notify us. We are now going to be extra vigilant with handwashing and hygiene in school. Our school nurse will be monitoring the children for signs of fever and we will call parents at the first signs of any symptoms. Working together we can help to prevent the spread of this flu outbreak. Thank you.